This is my fourth and last story from my short but most enjoyable visit to Tasmania last month. The island proved to be a chilly as people had said, with some mornings really cool at 14 C while just an hour’s plane ride north in Adelaide the temps were sitting in the mid-30s. But that also meant that the countryside was beautiful and the gardens lovely. 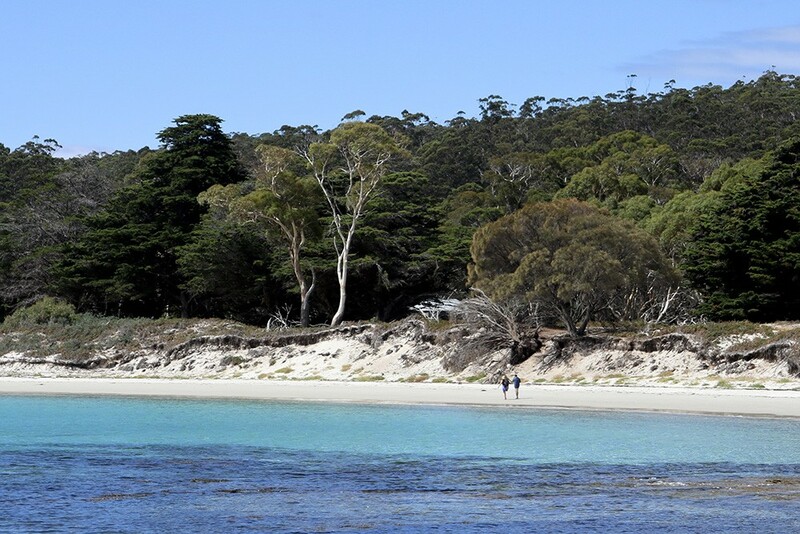 I would definitely like to visit again and see more of this Australian Island State. 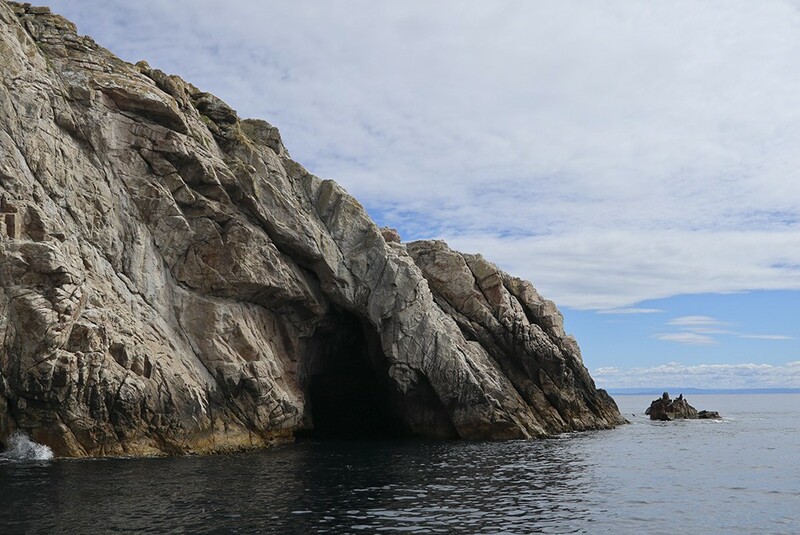 Our last day was really enjoyable, taking a boat ride on the ‘Spirit of Maria’ to the Isle des Phoques and then on to see the beautiful scenery and learn the history of Maria Island. 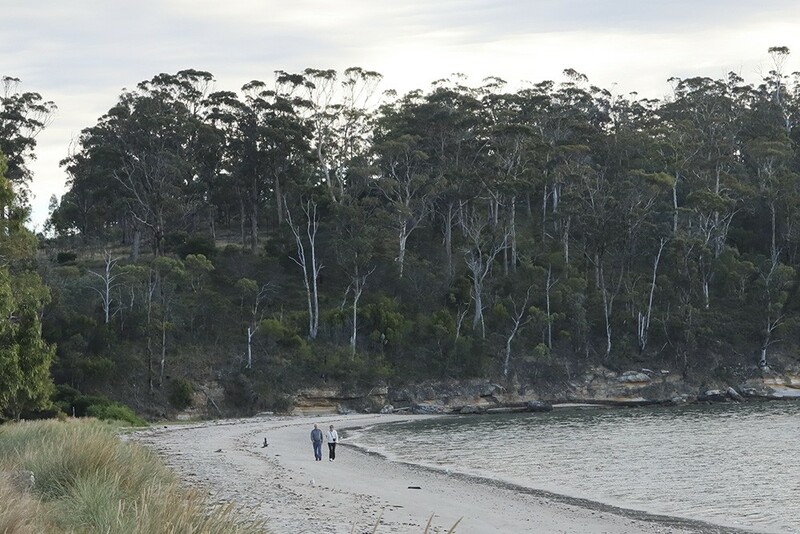 It’s about an hour’s drive from Hobart across to the east coast fishing village of Triabunna, and we stopped to stretch our legs along a stretch of beach at Orford a little before the port. From there we had our first glimpse of Maria Island looking formidable in the distance, and loved the colourful flare in the clouds above. First glimpse of Maria Island. A couple enjoys a leisurely early morning walk on a deserted beach near Orford. Our boat for the day with our most knowledgeable and charming skipper loading some tasty fare onto the boat. 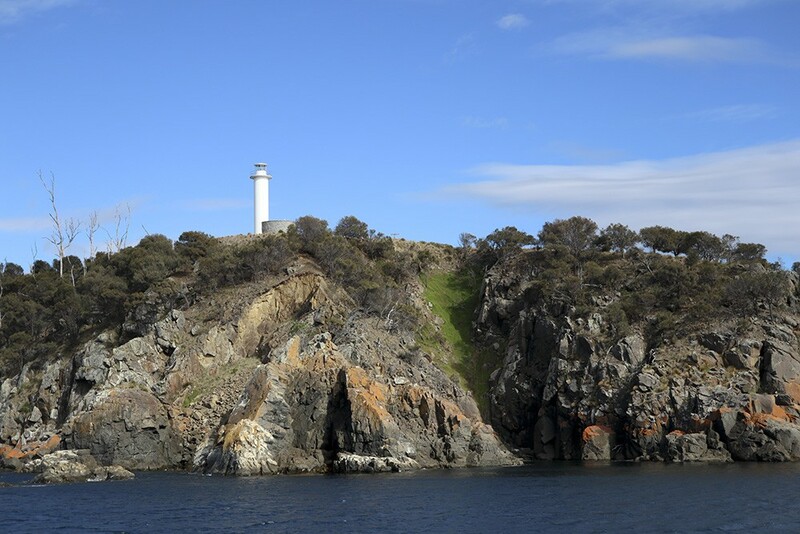 A lighthouse stands on a colourful rocky outcrop as we made our way out into the Tasman Sea. 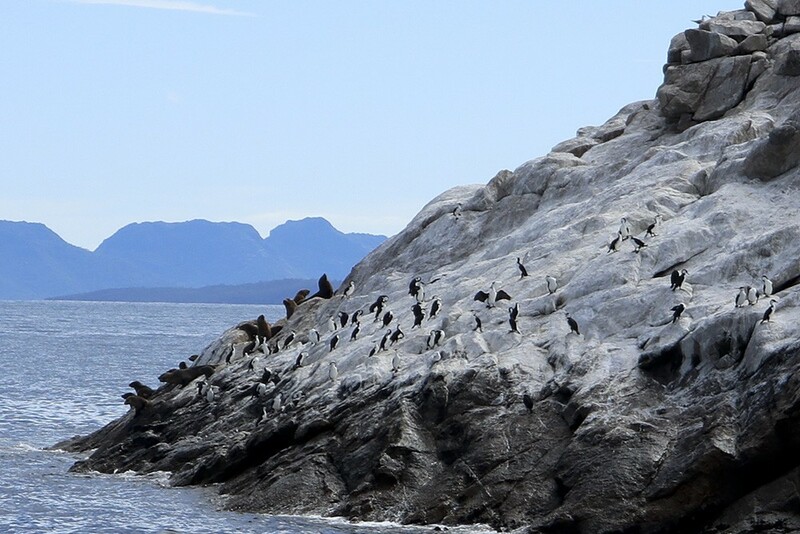 Sheltered by the Freycinet Peninsula, the 8 hectare Isle des Phoques is now a protected area and major breeding ground for seals. 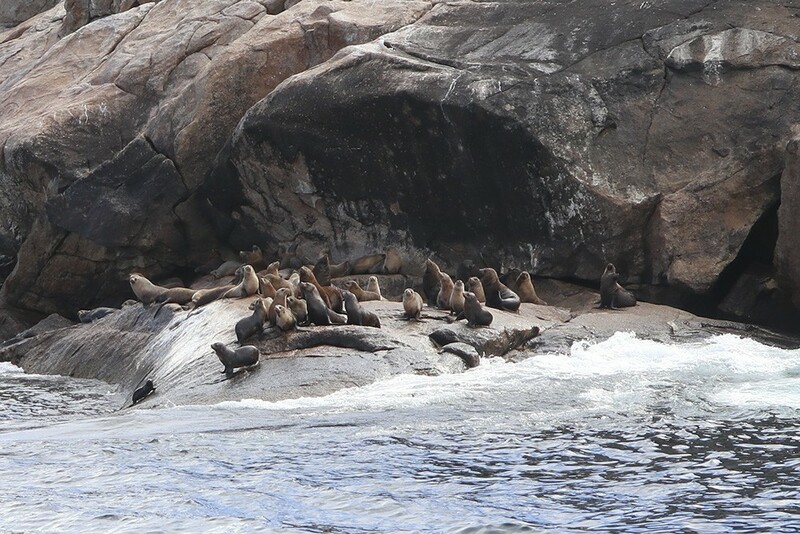 However, in earlier days it was a targeted area for seal hunting and the numbers plummeted, only now beginning to reach sizeable numbers again. 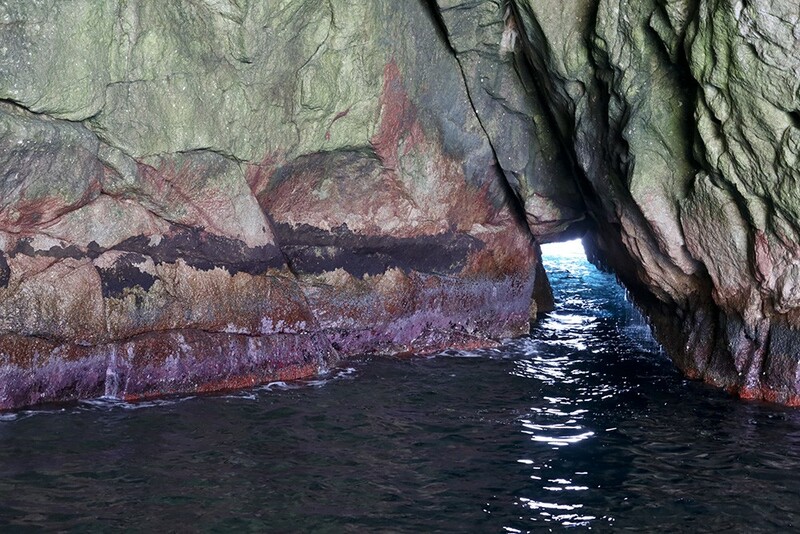 The island is granite and is also famous for the deep caves cutting underneath. 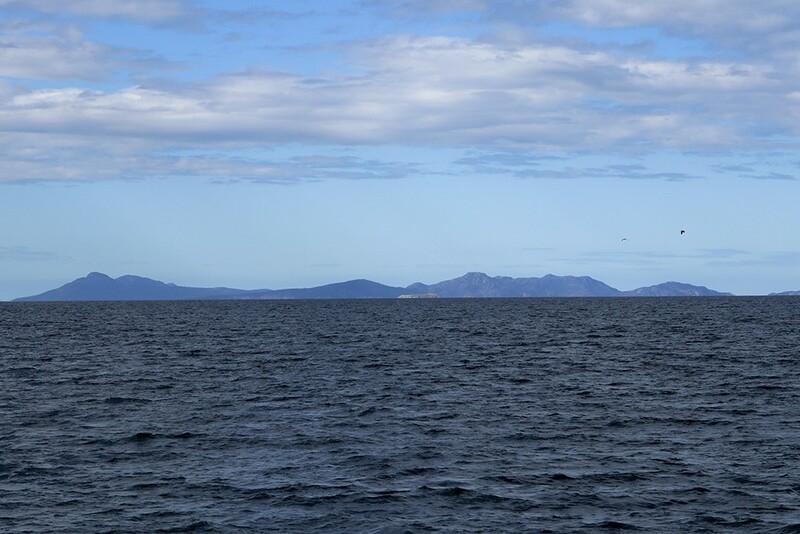 The tiny Isle des Phoques dwarfed by the Freycinet Peninsula further to the north. 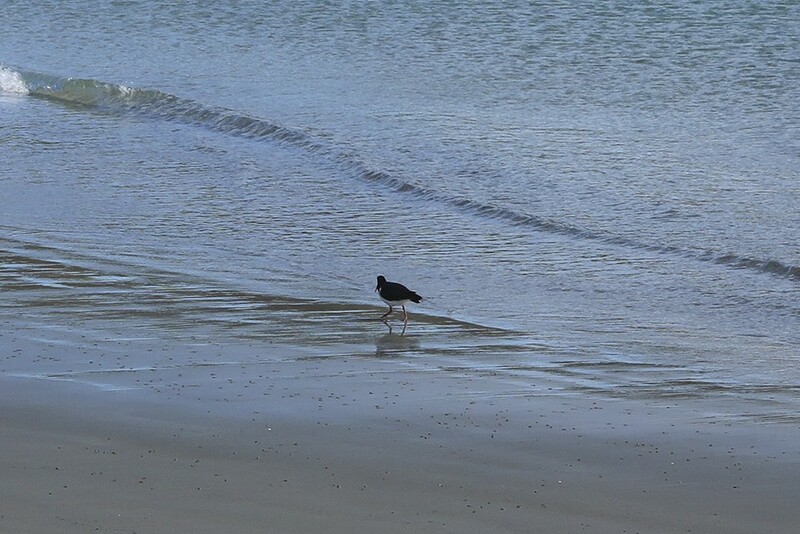 And there were indeed plenty of ‘phoques’ all over and all around the island. 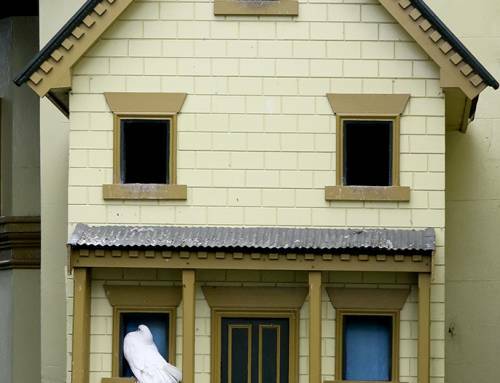 Many birds also nest on the island painting whole areas of it white with the guano. 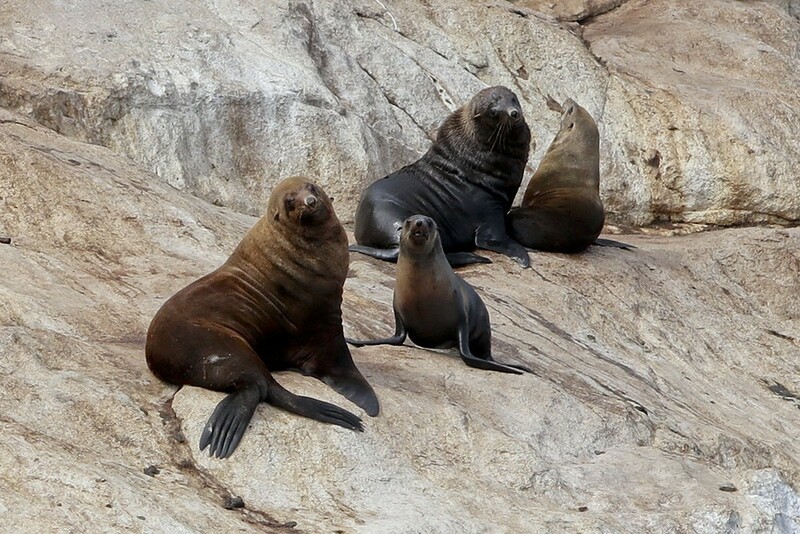 A family of seals hangs out on the rocks and stares at but is not intimidated by the intruders. 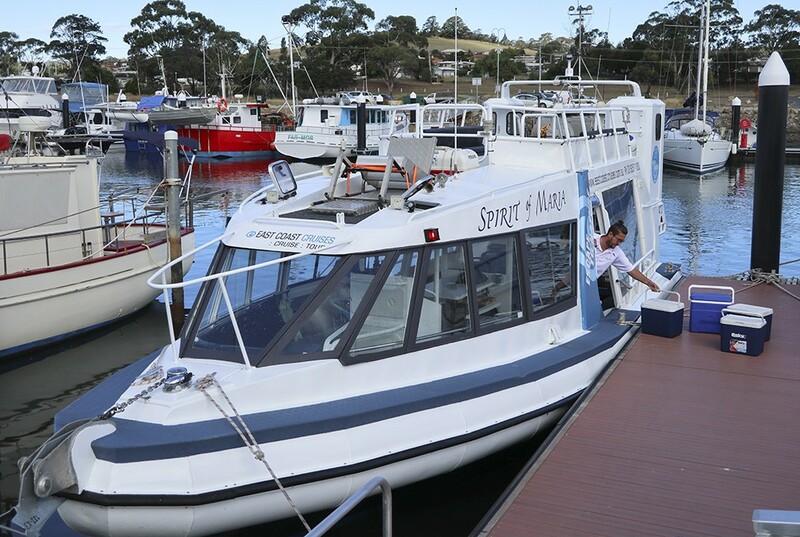 big enough for our 40-foot cruiser to enter and easily manoeuvre inside. Inside the cave, the colours of the rock were just glorious. 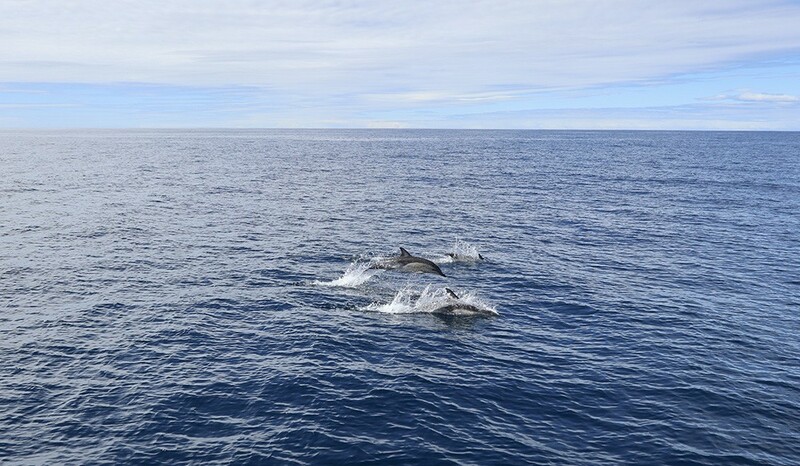 Not a good photo at all, but just an indication of the feeling as our boat was followed and circled by leaping dolphins. 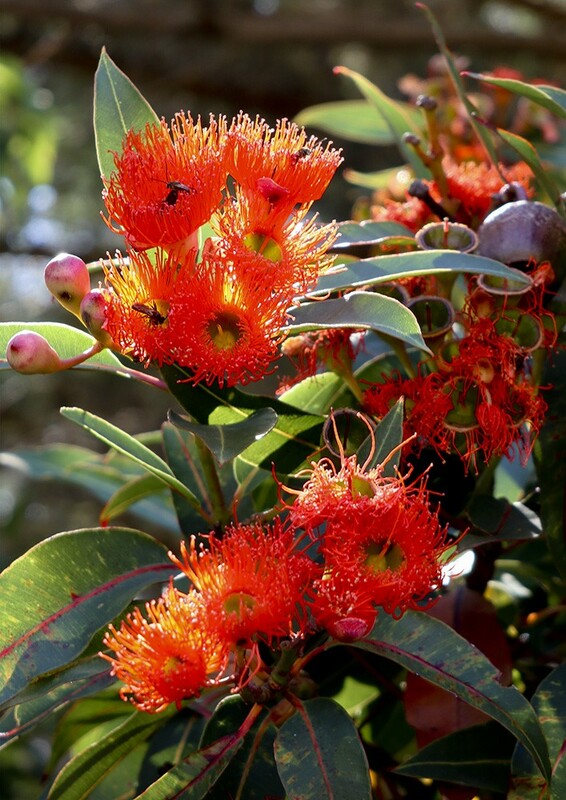 Our next destination, Maria Island, has a rich history. 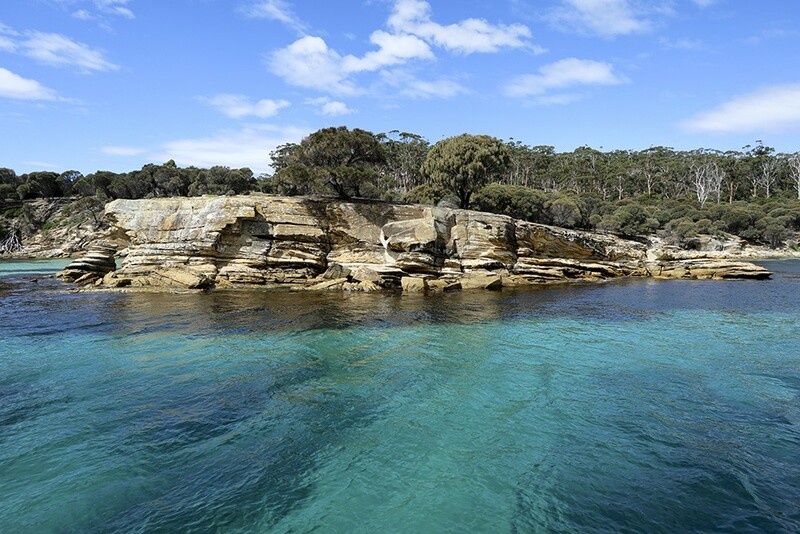 Before the colonial era, Aboriginal people of the Tyreddeme band of the Oyster Bay tribe journeyed regularly to the island and much evidence of their presence remains, particularly around the bays on either side of the island’s isthmus. 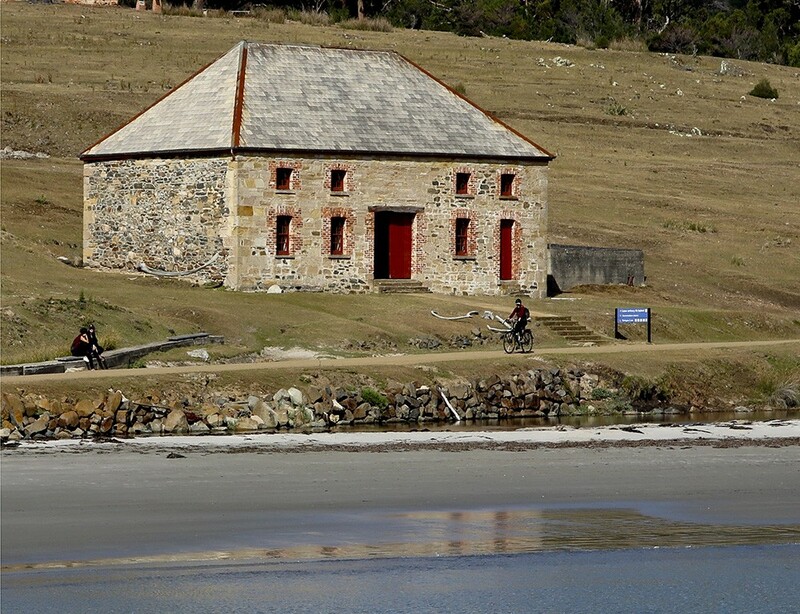 In 1802 the French expedition led by Nicolas Baudin encountered the Aboriginal people of Maria Island, as did the sealers and whalers of the early 19th century. 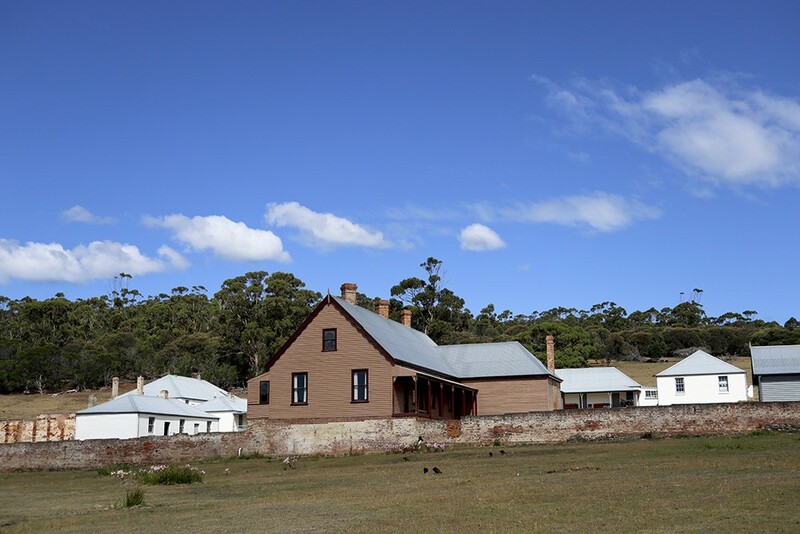 For two periods during the first half of the 19th century, Maria Island hosted convict settlements firstly between 1825 and 1832 and then as a probation station from 1842 and 1951. 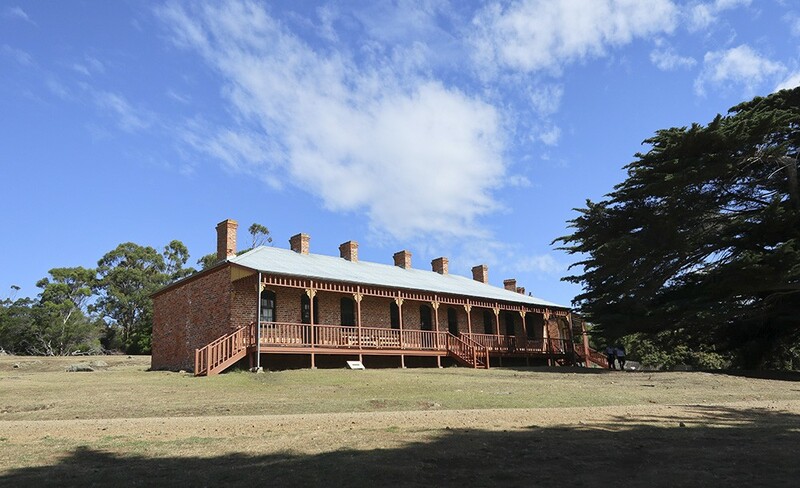 Several structures from the convict era remain in the Darlington area including the Commissariat Store built in 1825 and the convict penitentiary. 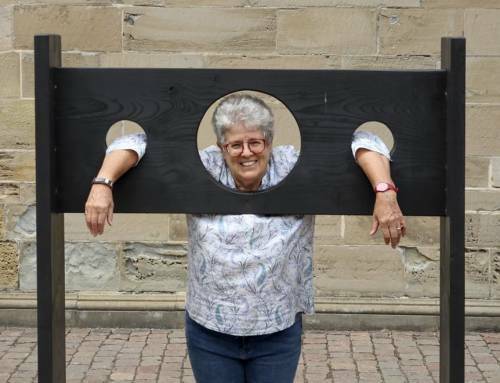 Seal hunting was conducted on the island from at least 1805 and shore-based bay whaling was also conducted in the 1830s and 1840s at four locations. Whaling ships sometimes anchored offshore and hunted for whales in the 19th century. 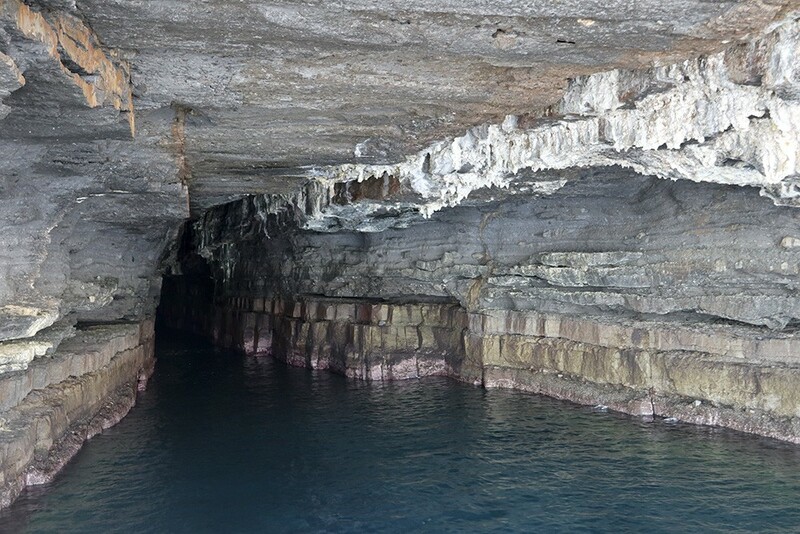 From the 1880s, the Italian entrepreneur Diego Bernacchi set up island enterprises including silk and wine production and a cement factory, quarrying limestone deposits at the Fossil Cliffs for the raw material. A substantial cement works was built in the early 1920s at Darlington. At the height of its fortunes in the early 20th century, Darlington had hundreds of residents and several hotels. By July 1930 all of these ventures had failed for a number of reasons including the Great Depression, poor quality limestone and competition from mainland producers, who were not burdened with high costs of transportation. 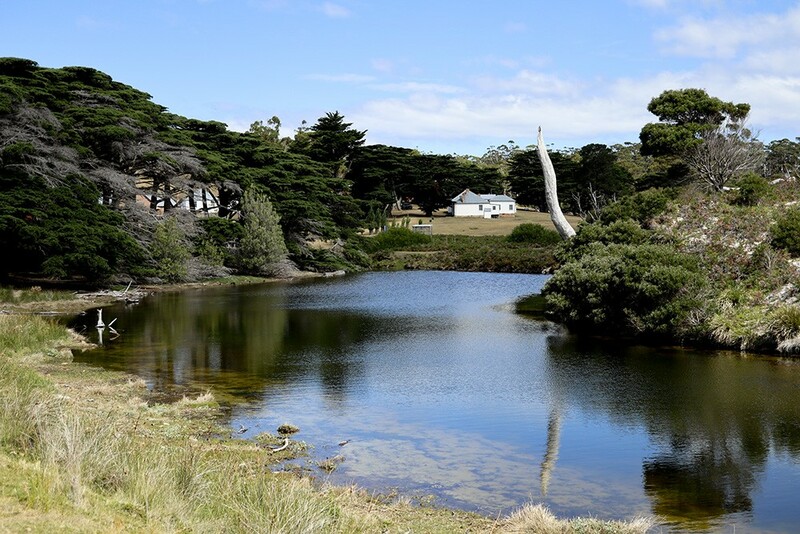 For a period of 40 years until the late 1960s the island was dominated by farming but then the Tasmanian Government took over all of the island’s freehold land and established the national park, proclaimed in 1972 and extended in 1991, to include part of the surrounding sea. 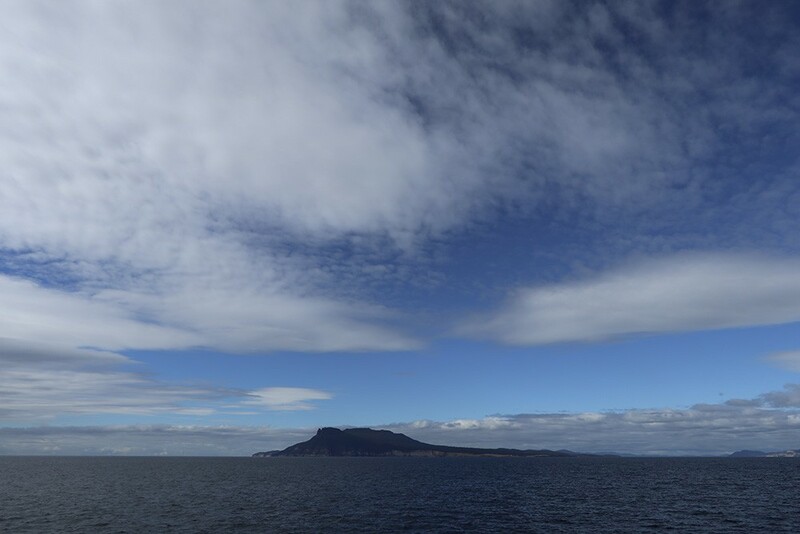 Approaching Maria Island from the north. 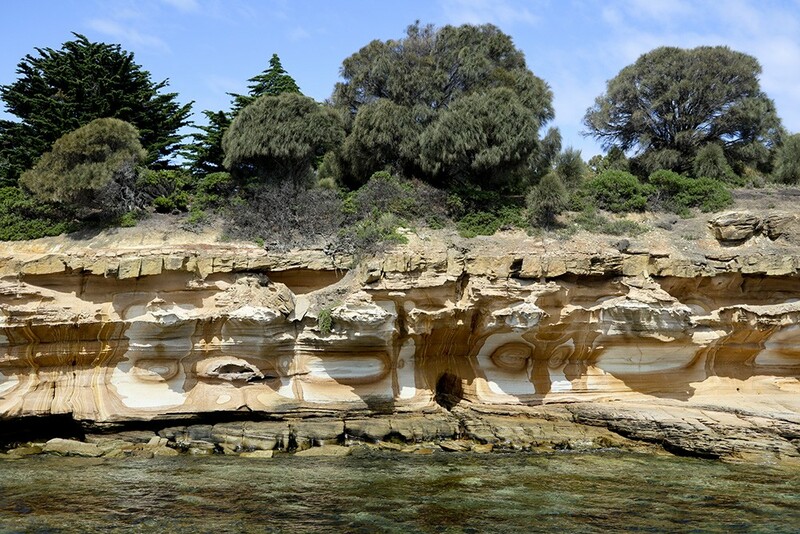 One of the caves along the Fossil Coast of Maria Island with the stalactites clearly visible on the ceiling. 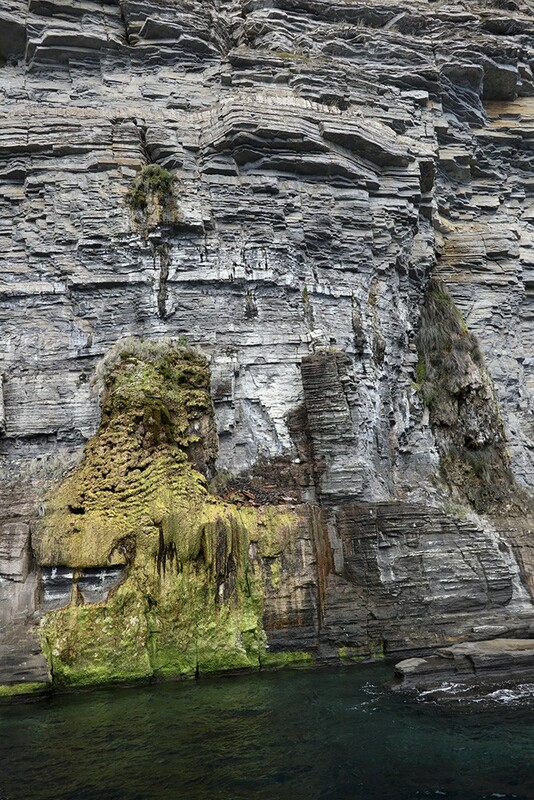 A tiny rivulet of water dripping out through the limestone cliffs has resulted in a stunning green cascade of calcium and moss. 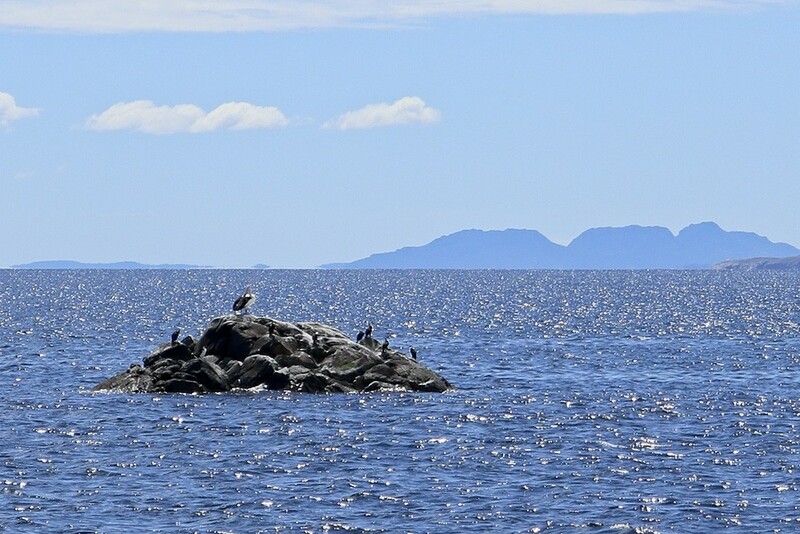 A wonderful calm summer’s day, blue on blue, and this rocky islet is a perfect hangout for seabirds. 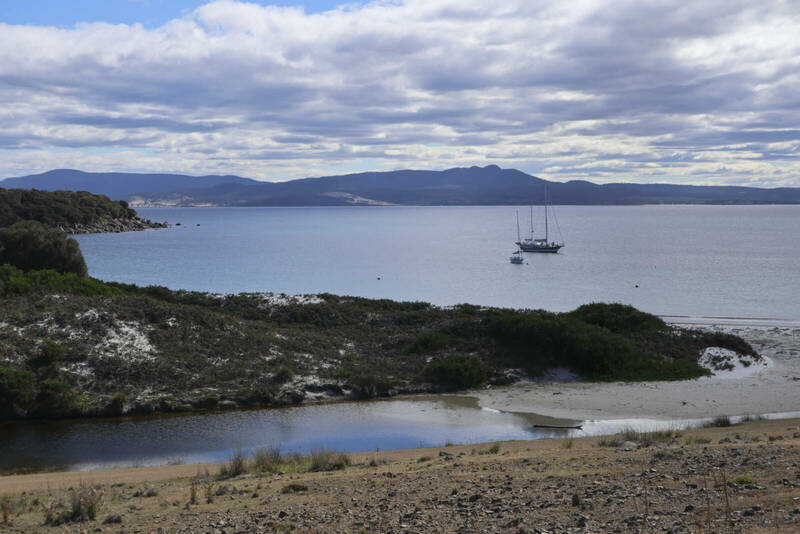 Time for lunch at Maria Island’s Booming Bay with this gorgeous view as we enjoyed a delicious meal and a glass of wine. Eroded bush covered cliffs above an azure blue sea. Known as the painted cliffs, the colours and patterns, stained by iron oxide, change as the cliffs erode. 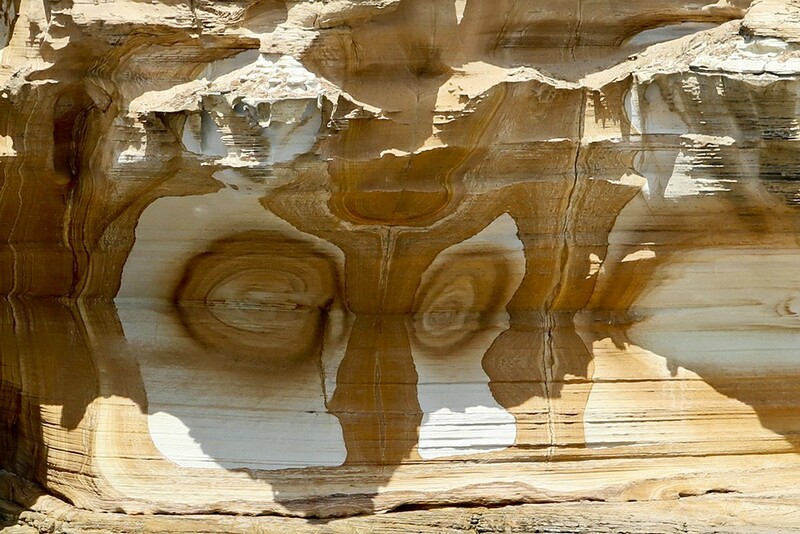 A close up of one section of the painted cliffs, looking to me just like eyes, a nose and a furrowed brow. Another gorgeous, deserted beach, perfect for an afternoon walk. 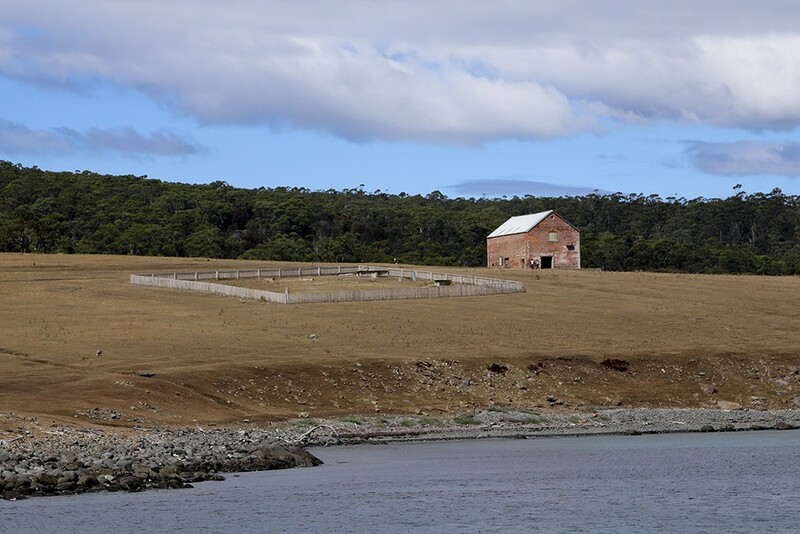 A loan barn and a sheep pens stand as testimony to the island’s farming days. A panorama of pretty much all that is left of Darlington, once a thriving town. 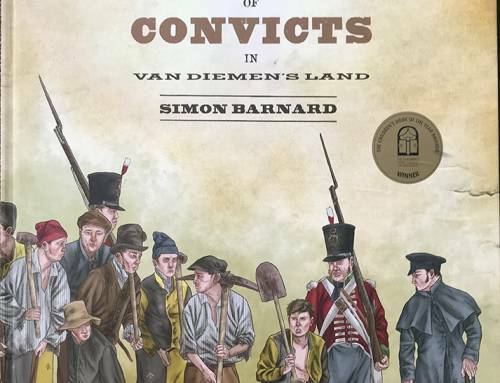 The Commissariat (built in 1825) now houses the Vistor’s Centre and a small collection of memorabilia from past days. Looking up the creek towards some of the buildings remaining from the convict era. Particularly furry kangaroos? 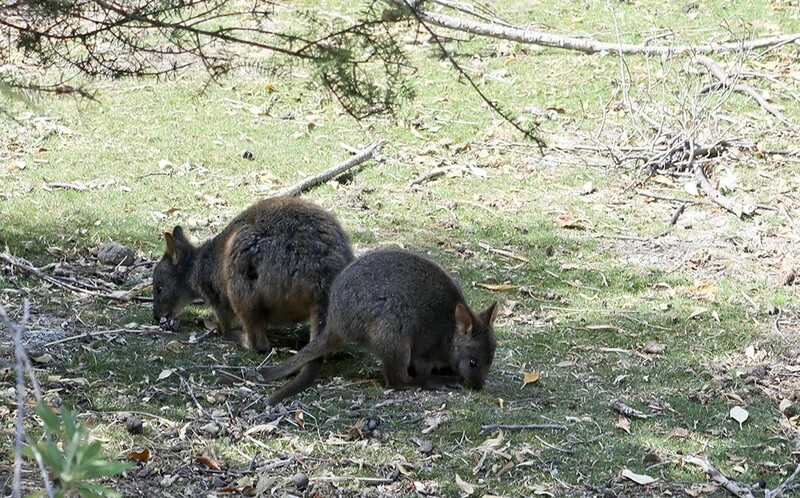 No, these are pademelons, of the wallaby family. Never met them before. A word about the pademelon. It is a stocky animal with a relatively short tail and legs to aid its movement through dense vegetation. It ranges in colour from dark-brown to grey-brown above and has a red-brown belly. Males, which are considerably larger than females, have a muscular chest and forearms and reach up to 12 kg in weight and over a metre in overall length, including the tail. 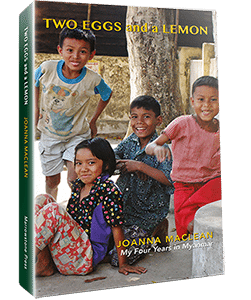 Females average only 3.9 kg in weight. Their unusual common name, pademelon, is of Aboriginal derivation. It is also sometimes referred to as the rufous wallaby. This species is extinct on mainland Australia because of predation by foxes and large scale land clearance, although two other species of pademelon occur along the east coast of the mainland. In Tasmania, however, the pademelon is both widespread and abundant. and some even used as accommodation for tourists. Such a typical colonial style with the wooden fretwork and long verandah. These lovely blooms caught my eye. One of the many wombats on the island. Have to say a word here about wombats, another of the interesting animals, native to Australia. They are marsupial mammals, have very short muscular legs, look a little like tubby bears and are the closest relative to the Koala. Wombats dig extensive burrow systems with their rodent-like front teeth and powerful claws. 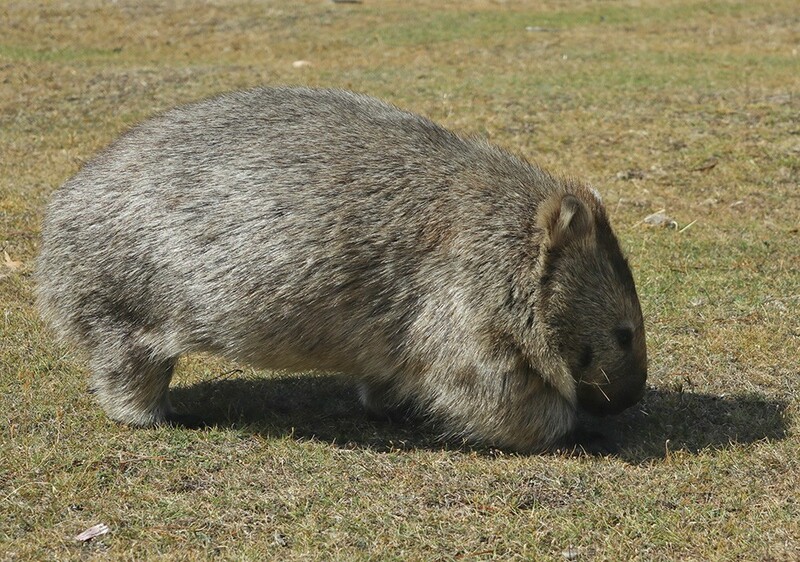 One distinctive adaptation of wombats is their backward pouch. The advantage of a backwards-facing pouch is that when digging, the wombat does not gather soil in its pouch over its young. Although mainly nocturnal, wombats may also venture out to feed on cool or overcast days. They are not commonly seen, but leave ample evidence of their passage, treating fences as minor inconveniences to be gone through or under, and leaving distinctive cubic faeces. 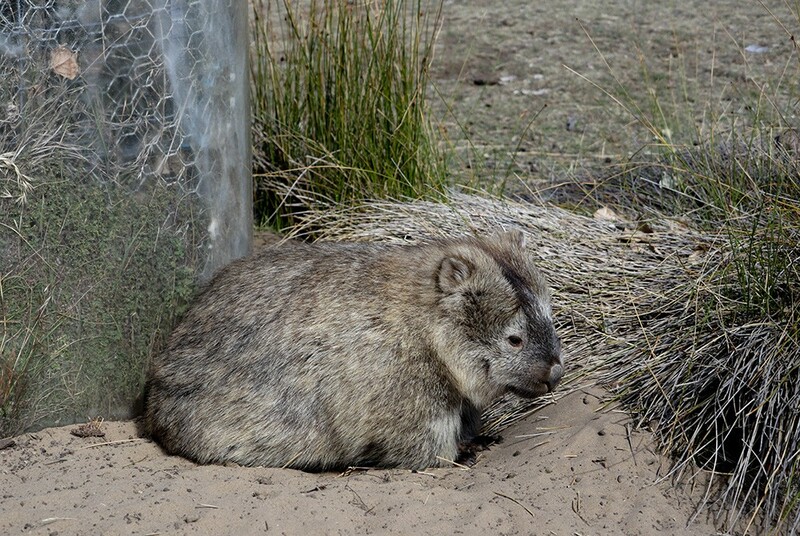 As wombats arrange these faeces to mark territories and attract mates, it is believed that the cubic shape makes them more stackable and less likely to roll, which gives this shape a biological advantage. The method by which the wombat produces them is not well understood, but it is believed that the wombat intestine stretches preferentially at the walls. The adult wombat produces between 80 and 100, two-centimetre pieces of poo in a single night, and four to eight pieces each bowel movement. A group of wombats is known as a wisdom, a mob, or a colony. Useful info for a quiz night, no? 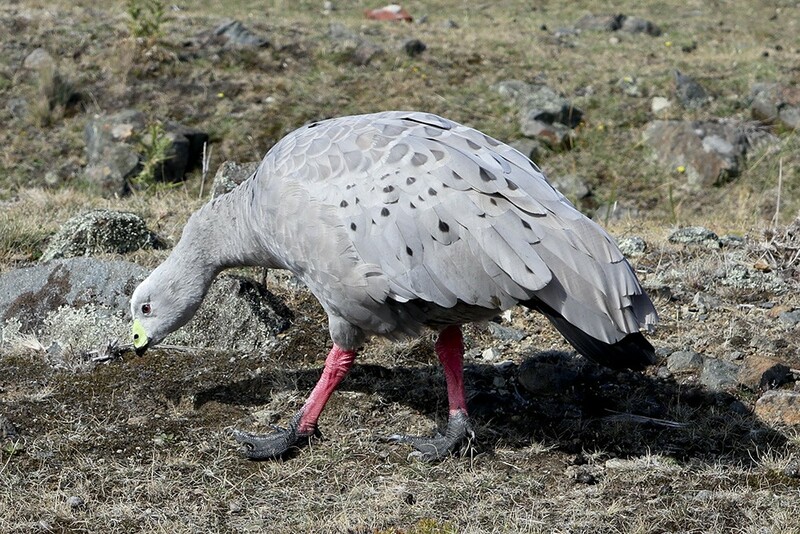 Looking as though wearing red socks and goloshes, this Cape Barren Goose searches for food among the rocks. A view over Darlington from the skeleton of a hotel on the hill, the convict settlement and the remains of the cement factory. With a three-master in the bay, it looks much as it must have a couple of centuries ago, with Tasmania in the distance. 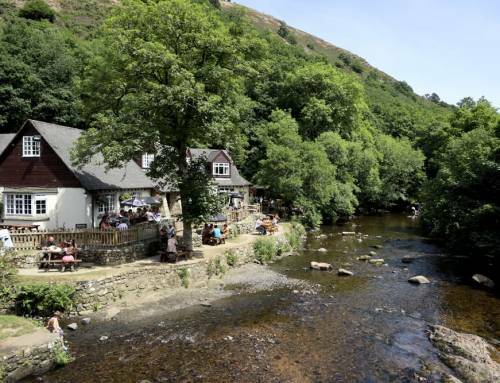 is a protected habitat and the wildlife can flourish as it did many moons ago. 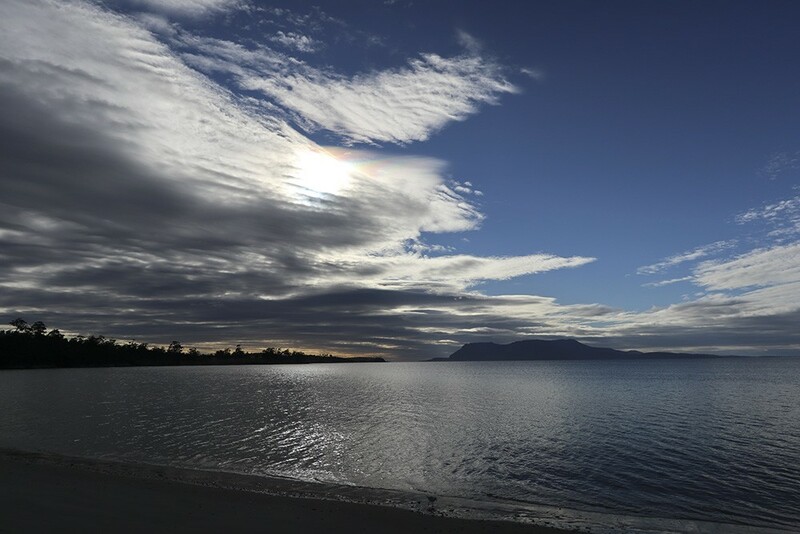 So ends the last of my Tasmanian blogs. 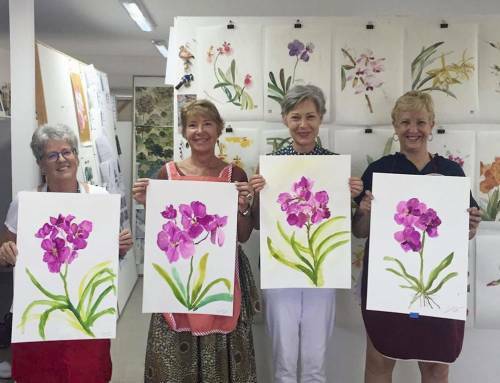 It was too short a visit to take in as much as one would want and didn’t even include any wine tasting or whisky distillery tours, but there may be other opportunities for that. 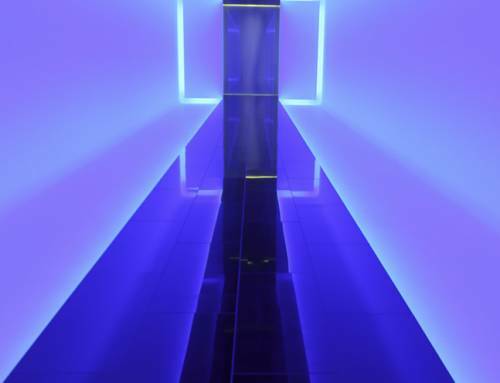 Until my next travels, look after yourselves.